The Extech EX470 is a True RMS Multimeter and Infrared Thermometer with Capacitance, Frequency, and Duty Cycle Measurements and is the perfect meter for HVAC or plant maintenance. The IR thermometer measures the surface temperature from -4 to 518 degrees Fahrenheit (-20 to 270 degrees Celsius) without contact. The built-in laser pointer centres the measuring area. Multimeter functions include AC and DC Voltage to 600 Volt, AC and DC current to 20 Amps, resistance to 40M, continuity and diode test. Also includes Type K thermometer for contact or air temperature measurements from -4 to 1832 degrees Fahrenheit (-20 to 750 degrees Celsius). The meter comes complete with test leads, Type K temperature probe, 9 Volt battery, protective holster, adjustable tilt stand and Velcro hanging strap. The EA33 is a compact and ruggedly designed meter which has a wide measurement range to 99,990 Foot Candles in 5 ranges and 999,990 Lux in 5 ranges with 0.001Fc/0.01Lux resolution. Features include: Store and recall up to 50 measurements with relative or real time clock stamp, luminous intensity (candela) calculation, a ripple function that excludes stray light from the primary light source measurement, multi-point average function, timed hold, relative measurement in absolute value or % deviation, comparator function with high/low alarms, and auto power off with disable. Complete with built-in stand, light sensor and protective cover with 36 (0.9m) coiled cable, protective holster, 6 AAA batteries, and carrying case. The RHT10 Datalogs Humidity and Temperature readings (up to 16,000 each) with user programmable sample rates from 2 seconds up to 24 hours for days, weeks and months. USB interface for easy setup and download. Dew Point indication via the included Windows software. User-programmable High/Low alarm thresholds for RH and temperature. Complete with 3.6-Volt Lithium battery, protective USB cap, mounting bracket, and Windows compatible software for analysis. The RH520A is a Paperless chart recorder that provides simultaneous digital and graphical display of relative humidity and temperature. The display also shows dew point, date and time and Min/Max measurements. Stored readings can be recalled on the display or downloaded to a PC to obtain a permanent record. Provisions for wall mounting or control panel swivels to act as a desk stand. The user can set audible and visual alarms with High and Low limits for humidity and temperature. Comes complete with detachable sensor probe with 1 meter cable, RS-232 cable with USB adapter, Lab View-based software, 100-240 VAC 50/60Hz adapter, and three AA batteries. 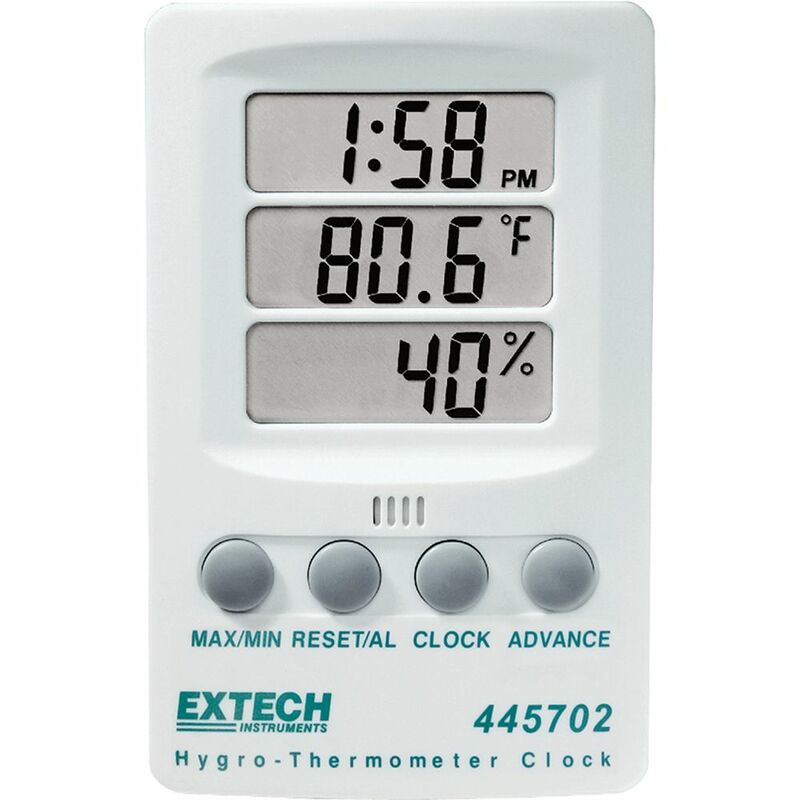 Hygro-Thermometer Clock The 445702 Combines 3 displays for Time, Temperature, and Humidity. Clock displays 12/24 hour time. Max/Min with reset function. Humidity: 10 to 85%. Temp: 14 to 140F or -10 to 60C. Accuracy: 6%RH; 1.8F, 1C. Complete with stand, wall mounting bracket and one AAA battery.